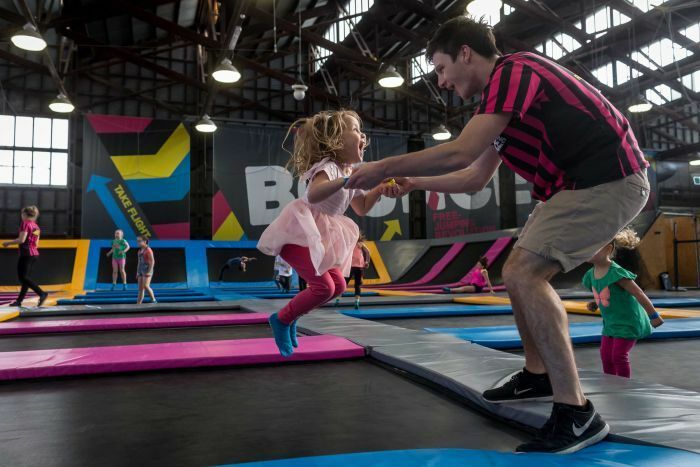 Bounce boasts it opened Australia's first indoor trampoline park in Melbourne six years ago. Co-founder Simon McNamara said Australia had more trampoline centres per capita than any other country. "I think it's a little bit in our DNA. A lot of us grow up on trampolines and love it as an activity," he said. 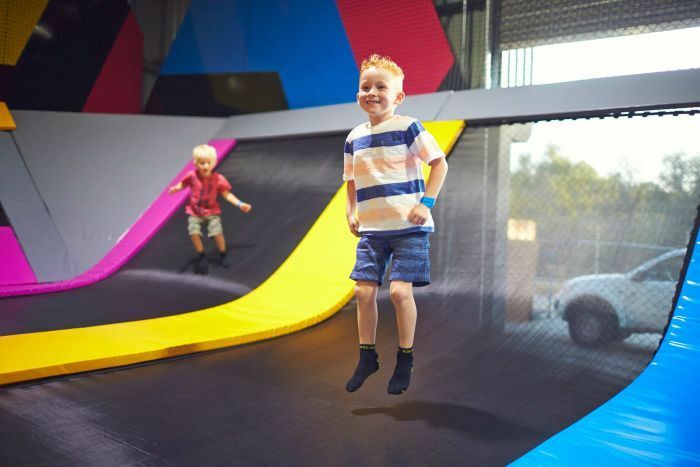 Secretary of the Australian Trampoline Park Association (ATPA), Chelsea Mannix, said no other business had ever grown this quickly as indoor trampoline parks in the leisure and amusement industry here. "The first trampoline park opened in Australia in 2012, and within two years, there were over 80 parks operating," she said. But that boom may be over. With the rise in trampoline park businesses has come a surge in personal injury insurance claims, and in turn, insurance costs. Some new operators cannot get insurance at all. 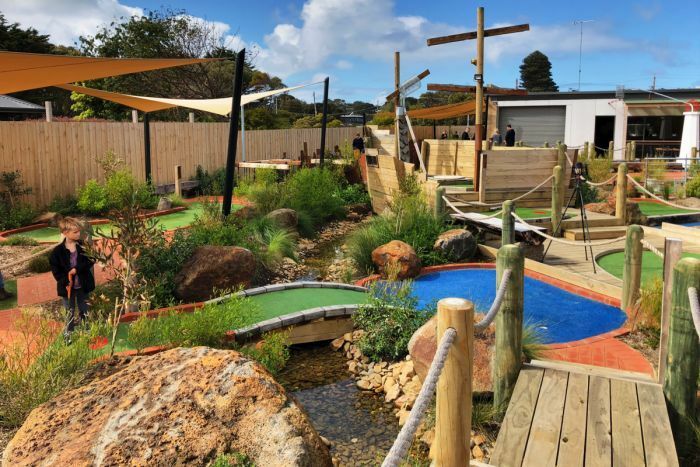 Lynelle Diamond runs a mini-golf business on Victoria's Great Ocean Road. "Trampolines are so popular [so] what we wanted to do was diversify and put trampolines out the front," she said. Told by her insurance broker that she would be able to get insurance, Ms Diamond went ahead, got approvals and bought trampoline equipment. But when it came time to activate her insurance, she got a nasty shock. "I got a phone call two days later telling me that, unfortunately, they could not get me insurance anywhere," she said. "What we were told is that the underwriter for trampolines worldwide had walked away." The explanation? The number of trampoline parks had grown to such a level that insurance claims had become too expensive. "We all got tarred with the same brush," Ms Diamond said. Ms Diamond says they were "devastated" by the news. "We've lost $50,000 in a small business — in a start-up business too. That was a really big hit to take," she said. She is now building a second mini-golf course instead. "I still get people asking: 'When are the trampolines coming?' And I have to say, 'Oh, I'm sorry, they're not coming'," Ms Diamond said. "We wanted to do something for the community, and we didn't get to do it." Mildura trampoline park operator, Ryan Forsyth, said the lack of insurance forced him to close his business. "The provider that we were dealing with, they wouldn't even renew that policy," he said. "We just couldn't find anyone that would support the activities that we were providing and were essentially forced to close. "We really didn't have any other option. We were never going to operate without that insurance available to us." Industry insiders say the number of trampoline parks has shrunk by about 25 per cent in the last couple of years. Managing director of HIB Insurance Brokers, Michael Alexander, said insurance costs were largely to blame. "Premiums have gone up over 300 per cent, excesses have gone up significantly," he said. Mr Alexander said many amusement and leisure businesses were struggling with big hikes in insurance costs, but it was trampoline operators that were hit the worst. 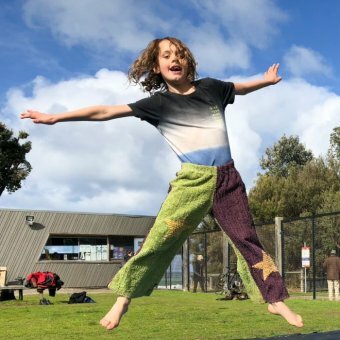 "Whether it be a trampoline park or a single trampoline at a caravan park, trampolines are a no-no for probably 98 per cent of the insurance market," he said. 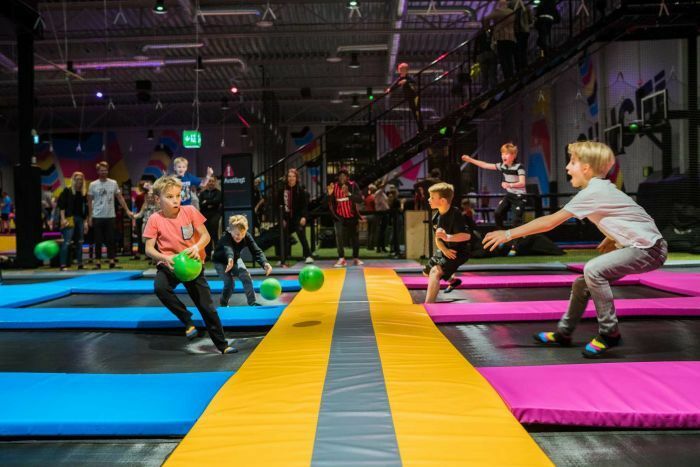 Almost 500 children were admitted to hospital emergency departments as a result of trampoline park injuries between 2012 and 2017. Most suffered fractures, sprains, and strains with about 20 per cent having spinal and head injuries. Mr McNamara said any injury was unfortunate but he said fewer people were hurt at trampoline parks than most people thought. "In the case of Bounce, it's just over one significant injury per 10,000 jumpers that come through," he said. "That is a pretty low level of risk for the benefit that they get through the activity that they're doing. "That's lower than the injury rate per participation for a sport like netball or like football so that surprises most people." Mr McNamara said it was worth considering the risks of physical inactivity and childhood obesity. "Trampolines are a fun, non-contact, non-competitive way to get kids and families exercising." Mr McNamara said while some trampoline parks had better safety records than others, the insurance industry was hiking costs for all parks. Bounce's premium costs have increased from about $30,000 per centre to around $100,000 per centre, and the excess charge per claim has risen even more. Their best option has been to self-insure, but not all operators can afford to do that, especially the smaller ones. "Unfortunately what's happened in Australia is we're going down this path of what America has," Mr McNamara said. He said an increasing culture of litigation in Australia and a propensity for insurance companies to settle, even when there is no fault, is contributing to the problem. "The ambulance chasing, no-win, no-fee lawyers then go and get more business, which then creates more claims and that then puts more insurance premiums up," he said. "People are taking on companies, or insurance companies more specifically, because they know they want to settle and that just creates this vicious cycle." Secretary of the Australian Trampoline Park Association (ATPA), Chelsea Mannix, said that with a rapid expansion of the industry, a rise in injury claims was inevitable. "It would be like building 80 new playgrounds; you're going to see a spike in the injuries that happen in playgrounds," she said. Trampoline park businesses say they are substantially safer than most backyard trampoline activities, which are often unsupervised and often involve more than one person on the trampoline, which is what causes many trampoline injuries. 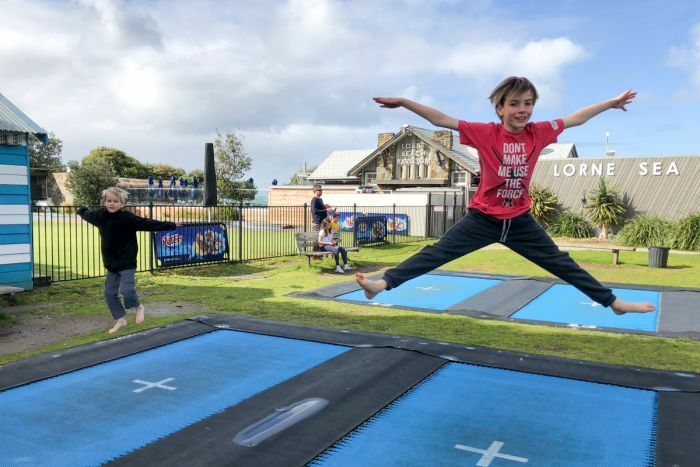 ATPA is working with Standards Australia to develop a universal safety standard for trampoline parks, but it is yet to be published. In the meantime, the Association has a voluntary code of practice and to be a member, businesses must sign up to it. Ms Mannix said so far only a fifth of the country's trampoline parks had joined. "It's expensive to make change, to create a really safe environment," she said. Ms Mannix said once the safest environment possible was in place, children should be allowed to be adventurous and active. "Certainly our customers are telling us 'Don't wrap the kids in cotton wool'; there has to be that freedom and fun and there is risk around," she said. Ms Diamond whose Great Ocean Road trampoline dream was dashed by the lack of insurance, also worries that children are being held back. "I've worked in the leisure industry my whole life [and] I think in Australia we are so risk-averse," she said. "You need to provide these activities and let kids get in amongst it. "Nobody's talking about life-threatening risk, just letting kids play and have fun, and climb trees and do all those things that we've all got afraid of these days, it's silly."